The Trading for Good report, commissioned by Lloyds Bank Foundation for England and Wales looks to provide a greater understanding into the impact which small and medium social enterprises are having on communities, in order to encourage more to be done to support them. The results reflect the diversity in their leadership and also the good they are doing for some of the poorest communities. To read the report and some of the stand-out findings visit the Social Enterprise UK’s blog. The Design Council have published the executive summary for Designing a Future Economy – a report looking at the role and value of design skills to the UK economy. The research looks at the skills used in design, the link between these skills and productivity and innovation, and future demand for skills. The results portray the high value of design to the UK economy – with design skills adding over £209 billion in GVA. The research also found that people using design skills are 47% more productive than the average UK worker. However, the research also found evidence of an emerging skills gap. With a decline in the numbers of students choosing Design related subjects at school, the report also outlines some suggestions on what could be done to reverse the decline; ideas include incorporating design into STEM subjects and improving support for design skills within career-long learning. Are Social Enterprises more sustainable, innovative and profitable? There are 471,000 social enterprises in the UK, making up for almost 9% of the total UK small business population. Government research has recently revealed that businesses which put their profits into social or environmental causes appear more likely to be innovative and profitable than traditional SMEs.The research also compared the types of challenges cited by SMEs and Social Enterprise Employers. Take a look at some of the highlights from the study which was commissioned by the Department for Digital, Culture, Media and Sport and the Department for Business Energy and Industrial Strategy on Enterprise Nation’s blog. Maybe you have an idea for a Social Enterprise? Book on to an IntroLab to tell us about it! With an estimated worth of £2.3bn (Centre for Economics and Business Research, 2015), the pop-up sector is thriving. A temporary stall or pop-up shop could provide an entrepreneur with the ideal opportunity to validate their product and gain valuable experience, in turn, assisting in the formulation of a compelling business case. A recent article on The Guardian’s website, explored this new temporary retail trend and talked about new startup – ‘Appear Here.’ Hailed as the ‘Airbnb for retail,’ Appear Here allows entrepreneurs to find temporary business spaces quickly and simply. The concept is not dissimilar from LUSU facilitated ‘Deli Takeover’ nights, a number of which took place last year, allowing food entrepreneurs and societies to organise their own event or test out their food related business idea. Lancaster Charter Market also offers the opportunity for new traders to rent a pitch for free if they are offering a product which is new to the market. What do you think? Would you fancy trialing your product on a temporary stall/pop-up shop? Read the full article on The Guardian’s website. Electric cars will be soon charging while driving! Wired-up roads are the future, mostly due to Tesla Motors, who triggered the interest in electric cars that this generation feels. Nikola Tesla, a genius will be not only please but also excited as his enthusiasm towards electrical vehicles has triggerred the interest of many. The wireless transmission of power is the future and is now turning into a reality. From a electric cars mat when you were a child to wiring the most popular roads in Britain, electric cars are certainly on the uprise. These electric cars are in more demand than ever due to their low local emissions, but they are also known for their expensive prices and not having a long enough driving range. So imagine if you could charge them without a plug in cable, or even while moving. Technology is advancing at a faster rate than ever with electric tooth brushes and smart phones being charged by being placed on top of a pad. Thanks to this technology, some electric cars are able to be charged by parking on top of charging pads, so that advancement of wire-up roads are closer than ever before! Recent studies show these roads with wireless charging coils are not expensive as you think and that the biggest part of the cost is the construction work itself. Read our official report here. Shift to a Gamified, Narrative-based Educational Assessment Regime?! Dr Alexander K. Kofinas explores the argument for a shift in educational assessment to a more narrative-orientated approach in an interesting article for the Chartered Association of Business Schools. With student engagement becoming an increasing problem, the close link between academic engagement and assessment regimes is an important aspect for educators to consider. Evidence of changes in methods of teaching to meet current needs are already evident including the increased incorporation of methods such a blended learning, flipped classrooms, practice-based learning and game-based learning. A key example of a method which can help educators to articulate a specific narrative to students is through the use of educational gamification. Good games are carefully designed, developed and implemented to hook players in, if an educational journey is designed in a similar manner, focused on engagement it could result in a more successful and satisfying learning experience. Limited access to startup finance is a gripe of many entrepreneurs, many of whom can only dream of successfully securing funding from venture capitalists. The Global Entrepreneurship Monitor 2015-16 Special Report on Entrepreneurial Finance, recently revealed that only 0.16% of small businesses in the United States received venture capital in 2015. The report is the first of its kind since the economic downturn in 2008 and discusses new research which indicates that since the 2008 recession, availability of funding and the cost of starting a business has evolved. Although startup costs have reduced, obtaining further funding has become much more difficult and consequently entrepreneurs are investing more of their own money into their businesses than in previous years. This has also led to the rise of crowdfunding platforms and community cooperatives as small business owners search for that vital funding to make their ideas happen. Read more on the report here. In July 2016, IT, Management and Organisational Change masters students Kennedy Simutowe & Oyinda Oludipe applied for a funding award for their business idea, Poslat. They tapped into the Enterprise Fund to pay for their travel and accommodation at the Histar competition semi finals in Oxford. Here, they share their experience of the day and what opportunities they were exposed to by attending the semi final. The Histar Competition 2016 was receiving entries up to 10th June, for startup ideas and big idea submissions. Under the big ideas entries, we participated by submitting our innovative shipping solution, Poslat. On 9th July 2016 we were elated to learn that our proposal had been accepted to the semi finals, which included an entrepreneurship and business bootcamp at Oxford University. In the run up to the Histar competition, we had also consulted with the Lancaster University Enterprise Centre (LUEC) from whom we received invaluable advice, mentoring and support for our idea. A few days prior to the Histar bootcamp, we were privileged to have an extensive session with the LUEC team with whom potential issues to do with the Poslat idea were discussed, including cross border movement of goods, customs and security. The lean development approach was suggested for Poslat. Lean development involves identifying the problem that needs to be solved and then developing a minimum viable product to begin the process of learning the customer’s requirements as quickly as possible. In the same session, the Poslat business model canvas was developed and analysed. On Saturday 16th July, we travelled to Oxford with all arrangements provided for and well facilitated by LUEC. Trust, security, customs and legal considerations. 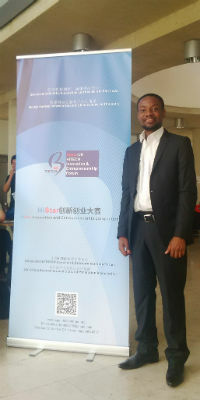 Other activities at the event included business lectures on embracing innovation, management strategies for startup companies, intellectual property, engaging the Chinese market and accessing Chinese investment. The business discussion panels featured interactive question and answer feedback from experts. 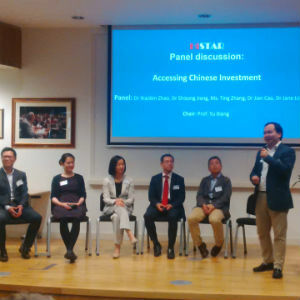 As the Poslat team, one of the questions we posed was ‘how well are Chinese investors receiving disruptive business models (such as AirBnB, Uber) founded on the sharing economy concept?’ to which the answer was very encouraging; many investors are ready to support ideas and startups of all kinds, especially disruptive ones, as long as they are well thought out and hold promise for meaningful returns in the long run. A networking lunch was also held and this provided an opportunity to exchange ideas with and received ideas from some of the business experts and mentors. Overall, the Histar semi finals were well organised and delivered more insights on entrepreneurship and business development for our team. We made friends from all over the UK and exchanged contacts with potential business partners for the development of the Poslat shipping idea. We are confident that based on our innovative solution and the effective business pitch presentation, we will be announced as winners in the final stage on 20th August 2016. Following this blog piece, Kennedy and Simutowe were shortlisted for the competition final in August… congratulations guys! The State of Social Enterprise Report 2015, supported by Santander, is the result of extensive research into the state of the sector. Social enterprises in the UK are outperforming mainstream SMEs, and are thriving in this time of significant social and environmental issues. In fact, in terms of turnover, job creation, innovation and optimism, UK social enterprises are at the forefront of the economic recovery. Social Enterprise UK’s statistics show that 50% of social enterprises report a profit, whilst 26% break even. In terms of job creation, 41% of social enterprises introduced new roles in the past 12 months compared with only 22% of SMEs. Furthermore, 59% of social enterprises employ at least one person who is disadvantaged in the labour market and around 40% have a director with a disability. The report concludes with the view that social enterprises are changing in nature and are part of the most dynamic, fast moving areas of business in the UK – there’s really never been a better time to get involved in social enterprise and make a positive impact. If you want to make a difference and learn more about social enterprise whilst you’re at University, why not work with U Social Venture? A group set up by students with a desire to create change and do good. What does the election of Jeremy Corbyn mean for small business owners? New Labour leader, Jeremy Corbyn, made a number of promises to SME’s with his campaign of ‘standing up for good businesses’ , prior to his election victory last weekend. Following a turbulent start to his leadership, Enterprise Nation ask five small business owners for their take on Corbyn’s chances of success as Labour leader, and how confident they are that he will protect their interests. What do you think of Jeremy Corbyn’s promises to small businesses, and what would you like to see him do next?